Hometown hero in the city of Riverside, CA and American swimmer Tyler Clary won the gold medal in the men’s 200 meter backstroke with a time of 1:53.41. Clary set a new Olympic record while picking up his first Olympic medal. Clary never led the race until the final 50 meters. After a slow start, he made a strong effort on the turn that got him into second place to start the final 100 meters of the race, which eventually led to Clary catching up to the defending champion, Ryan Lochte, who was currently leading the race. “The other two guys that medaled in that event are capable of some pretty extraordinary things. I knew it was going to be a dogfight,” Clary said. Ryosuke Irie, from Japan, finished second with a time of 1:53.78 for the silver medal while Clary’s American teammate, Lochte, took the bronze medal with a time of 1:53.94. Lochte held the record, before Clary, in the men’s 200m backstroke with a time of 1:53.94, which he set at the Olympic Games in 2008 at Beijing. 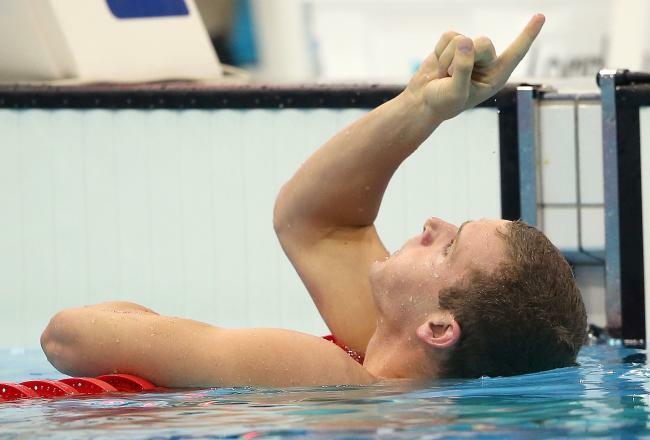 After breaking the record and winning his first gold medal, Clary looked up and pointed a finger toward the roof of the Aquatics Centre, as a way to honor his high school coach at Riverside Poly, Kevin Perry, who had passed away of cancer. Clary also took to twitter in the early morning hours as he tweeted about his race and what went through his mind at the time. Back in Clary’s hometown, Riverside City College swimmer Andrea Antonissen believes that Clary’s performance in the Olympics may have a huge impact on the aquatic programs in Riverside County. She also thinks that Clary could be a role model and someone that young and beginning Riverside County swimmers may begin to emulate when they compete in the pool. “I think that it will give the young swimmers a new perspective and goals,” she added.